Sunday offered up the match I was perhaps most looking forward to along with the shortest rail journey of the weekend, a mere 10 minutes from my base in Hengelo to Almelo. Almelo is home to Eredivisie Heracles (which incidentally translates as 'Hercules') who today were playing host to FC Twente from Enschede in the Twenthe derby. Later that evening the Netherlands equivalent to Match of the Day would show extended highlights of the match and first on the bill before PSV and Ajax thus indicating the importance and interest in this local derby. 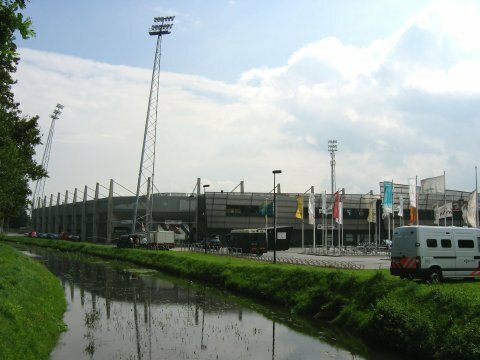 If planning a trip to Heracles, remember that the nearest station is De Riet and not Almelo which is a good few miles from the Polman Stadion situated on the southern outskirts of the city. From De Riet, it's no more than a ten minute walk. Admission was 27 euros and a programme an unusual part glossy, part matt cover, one euro.